You'll be £25.00 closer to your next £10.00 credit when you purchase Building for Battle: Hitler's D-Day Defences. What's this? Following nearly two years of planning and exacting preparation, Operation Overlord, the Allied invasion of the Nazi-dominated European continent, was mounted in the early hours of 6th June, 1944. It was to be a pivotal event leading to the end of the Second World War and victory for the Allied forces. The invasion itself was centred on the largest amphibious landing operation in history. It involved 7000 naval vessels, 3000 aircraft, 17000 American and British paratroopers and thousands of additional military personnel. What awaited the Allied landing forces - many of them suffering the effects of sea sickness when they were delivered into the surf of the five main landing beaches on the Normandy coast of France - were key elements in the formidable defences of Hitler’s vaunted ‘Atlantic Wall’. The Wall was a 2500-mile chain of various types of fortifications stretching from the North Cape to the Bay of Biscay. That portion of the German defences between Caen to the east and Cherbourg to the west was particularly menacing, due largely to the planning and implementations of Feldmarschall Erwin Rommel, appointed by Hitler to take charge of the Atlantic Wall defences. D-Day Defences revisits many of the locations within the five-beach landing area of the invasion forces, focusing on the various aspects of the German fortifications, the types of defensive systems employed against the American, British and Canadian invaders, and the results experienced by both invaders and defenders in the Allied struggle to gain and hold possession of that pathway to Berlin. The book is well illustrated throughout, with a mix of archive photos, maps, some battlefield relics and especially modern day photos of many of the remaining bunkers and defences which remain to be seen today, over 70 years later. 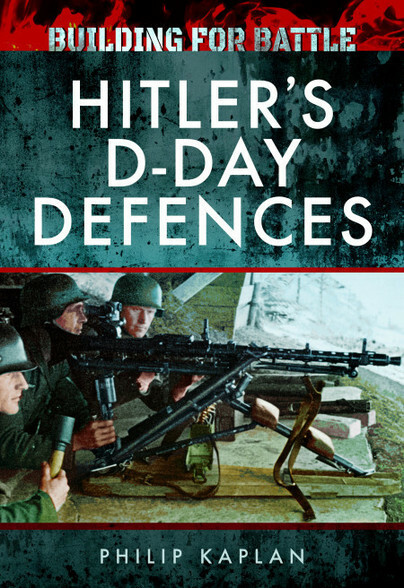 Books dealing with D-Day and the battle for Normandy tend to be fairly perfunctory when it comes to the Nazi defences, unless they are battlefield guides. Prolific author Philip Kaplan’s welcome analysis helps fill this gap. Lavishly illustrated in b/w and colour throughout, one of its strengths is the then and now photos - these show the fate of Hitler’s formidable Atlantic Wall. While reassessing the likes of Pointe du Hoc, Merville and Longues-sur-Mer, Kaplan also tackles the myth of the German 352nd Infantry Division at Omaha. A concise introduction to the topic - highly recommended.